Ocwen obtained a copyright on the phrase “Helping Homeowners Is What We Do.” Try finding one of those homeowners who claim they were “helped” by Ocwen, the largest nonbank mortgage servicer in the United States. 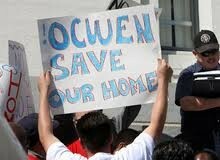 For many years, Ocwen claimed it did a better job than banks at keeping people in their homes. Given the track record of Bank of America and some of the other big banks, the bar was set pretty low. Still, Ocwen can’t even make that claim. In February, New York State Banking Superintendent Benjamin Lawsky put Wells Fargo’s plan of shipping its loan servicing duties to Ocwen on hold. The reason? Huge customer complaints and poor quality control. Now, Wells Fargo has quietly abandoned those plans. In October, Lawsky accused Ocwen of backdating letters to borrowers concerning the ability to seek a modification of their mortgage terms. The letters are time sensitive. New York believes the snafu likely caused significant harm to borrowers. Everyone makes mistakes. While Ocwen thinks the “mistake” was limited to 283 borrowers (out of a pool of 2.8 million loans), Lawsky says it potentially happened “hundreds of thousands” of times. After being called on the carpet by regulators, the company now says it doesn’t know how many backdated letters were sent. Our bet is that Lawsky’s numbers are more accurate. Earlier this year, New York State raised other concerns with Ocwen. In February, the state raised concerns about potential conflicts of interest between Ocwen and four other companies. The five companies all had Ocwen founder William Erbey as chair. The state said the relationship could harm borrowers and “push homeowners unduly in foreclosure.” The other companies are in related businesses such as selling or renting foreclosed homes. All these examples suggest “Helping homeowners is what we do” is certainly not the case with Ocwen. The federal False Claims Act, a Civil War era law, allows people with inside information about a fraud involving a government program to take action in the name of the United States. The courts can give whistleblowers between 15 and 30% of whatever gets collected by the government from the wrongdoer. Since the federal government backs most residential mortgages, fraud that increases foreclosures may be subject to prosecution under the False Claims Act. We represent whistleblowers and help them stop fraud and earn the maximum award allowable under the Act. To date, we have brought several, billion dollar cases. Obviously, not every case is that large but mortgage servicing fraud is big business. Think about it… as we get ready to celebrate Thanksgiving, thousands of struggling homeowners are wondering where they will live. If you worked at Ocwen (or any other mortgage servicer) and have information about fraud, give us a call. We are working all week and through Thanksgiving. If you are a homeowner who has a particularly horrific servicer story, we would also like to hear from you as part of our due diligence efforts. Potential whistleblower with information? Feel free to call as well at (414) 704-6731 (direct). All inquiries protected by the attorney – client privilege and kept in confidence. May 2017 – Important information for Ocwen serviced loan customers. MahanyLaw is contemplating multiple class action lawsuits against Ocwen. Please see our Ocwen fraud investigations page for more information.